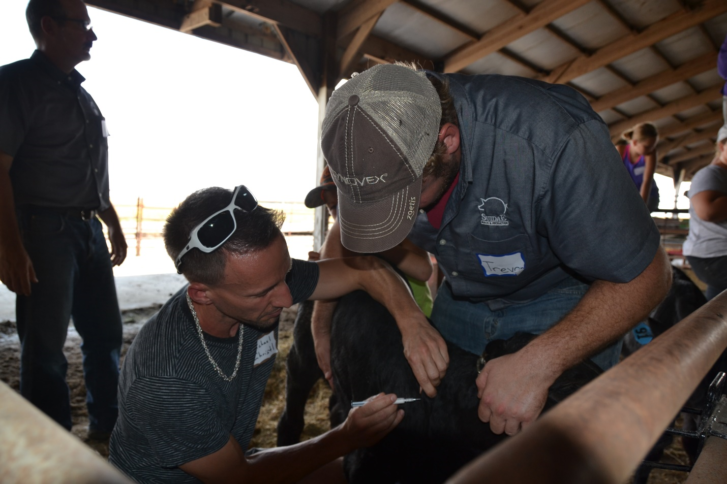 Veterinarians Kurt Van Hulzen and Trevor Schwartz of Suidae Health and Production, with veterinary assistant, Julie Wheelock of Lake City Veterinary Clinic, led a hands-on field day with 34 attendees on September 14. Attendees came to brush up on their animal care skills. The two veterinarians gave an overview of different husbandry practices from dehorning calves, castrating and how to perform a necropsy (an animal autopsy). Kurt and Trevor explain goat care steps to 34 field day attendees. Kurt and Trevor advise dehorning calves at 5-7 weeks of age as their horn buds begin to protrude. At this age, dehorning is less stressful on the calf and is easier to accomplish than when they get older. Electric dehorners like, Buddex and HornStop, kill cells at the base of the horn which keeps the horn from growing. The easiest way to prevent horns is to select polled bulls to pass that genetic trait on to their offspring. Bloat is a common issue to watch for in any age of cattle. Calves are especially prone to bloat, which is caused by excessive gas created in the abomasum. Clover-rich pastures can cause bloat, so calves will need to be gradually transitioned onto pastures containing lots of clover. Probiotics can help treat symptoms. Another form of bloat creates excess froth and is due to grain overload. In this case, the calf will need to be tubed. The tube goes through the esophagus to the rumen, making sure not to accidentally insert the tube in the trachea (windpipe). “Use the size of your thumb to determine the size of a hose you should use, and make sure the hose has no sharp edges,” advised Kurt. Kurt assisted a field day attendee who volunteers to dehorn a calf with an electric dehorner. Like humans, livestock will run a fever when they are sick. The normal temperature range for calves is 100.5-101.5 ⷪ F and 102-103 ⷪ F on a hot day. A rectal thermometer is recommended. Along with temperature, other things to observe are coughing, scours (diarrhea) and droopy ears. Trevor helps a field day attendee administer a vaccine on a calf. To castrate calves Kurt and Trevor demonstrated the banding method, using an elastic band placed above both testicles, which will then atrophy and fall off after about ten days. If seen, cover the eye with a patch to keep flies and sun away (Glue patches are recommended over stitching the eye up). The antibodies in the secretion from infection will help heal conjunctivitis. For Kurt and Trevor, who are both swine specialists, highlighted how pigs have a quick generation interval allowing farmers to generate favorable cash flow. When pigs are kept healthy, they are extremely efficient in putting on weight (most efficient are fish and chickens). At 30 days of age and around 20 pounds, weaned pigs are ready for the outdoors. To determine the weight of your pigs and other livestock, use this guide on estimating animal weight. If pigs are raised on concrete and will not have access to dirt, Kurt and Trevor recommend an iron shot. 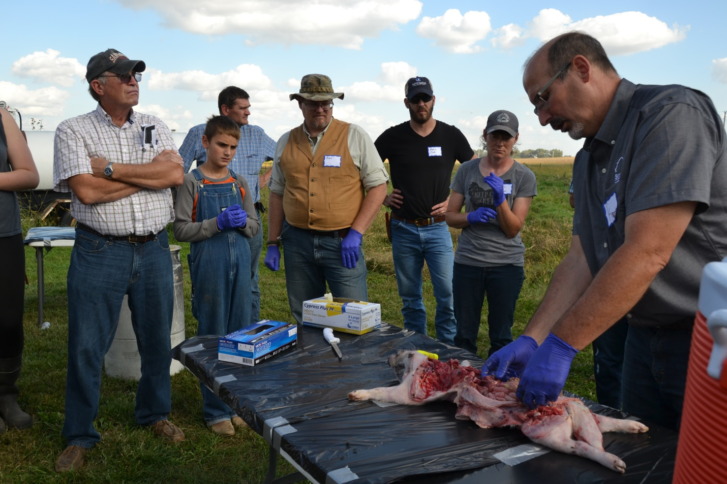 Trevor instructs field day attendees on how to prepare for castrating pigs. Many illnesses that inflict pigs are caused by airborne transmission, and due to the high density of pigs in Iowa, farmers deal with many airborne diseases. “What a pig needs to thrive is good air, good water and good feed,” says Kurt. On-farm biosecurity is also essential. “The biggest thing you can do to lessen the spread of disease is change your clothes and wash your hands,” says Trevor. When castrating pigs, make slits with a scalpel, pinch out both testicles, then spray with iodine. The industry standard is to castrate pigs at seven days or younger. 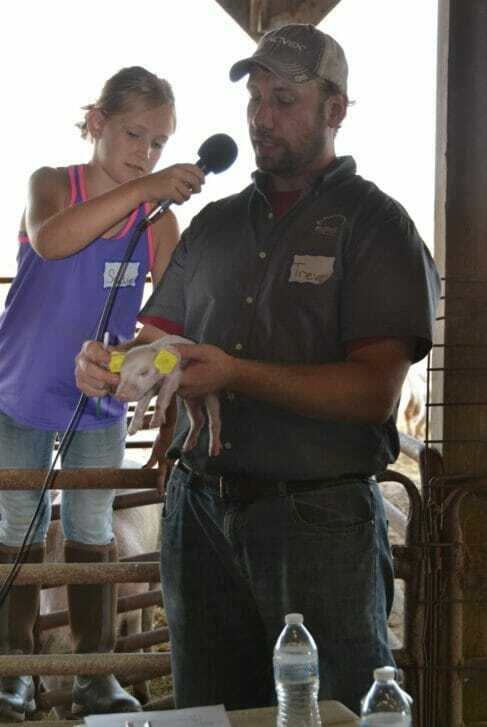 A field day attendee volunteers to castrate a piglet with Trevor’s assistance. Vaginal: Roll the prolapse back into the body cavity then use an X suture to stitch it up. Use cotton to stitch and remove it just before calving and lambing. Uterine: This is the most difficult prolapse to deal with. Use gravity to help put the uterus back inside the body. For small animals, such as a sheep, hang with back legs over a gate to perform this procedure. Put sugar on a prolapsed organ to draw out water and shrink swelling. For goats, internal parasites can cause serious issues. Kurt and Trevor recommend rotating dewormers annually; quarterly if there are bad parasite problems in the herd. To decrease parasite pressure, Trevor suggested culling the bottom 10% of your herd every year. One method of castrating bucks is to cut the bottom third of the scrotum, and then pull the testicles, releasing the muscle that holds them in place. To cut, use a small disposable scalpel and apply steady pressure. Trevor then used a Henderson Castrating Tool, which uses twisting action to sever the cord that attaches testicles to the body. 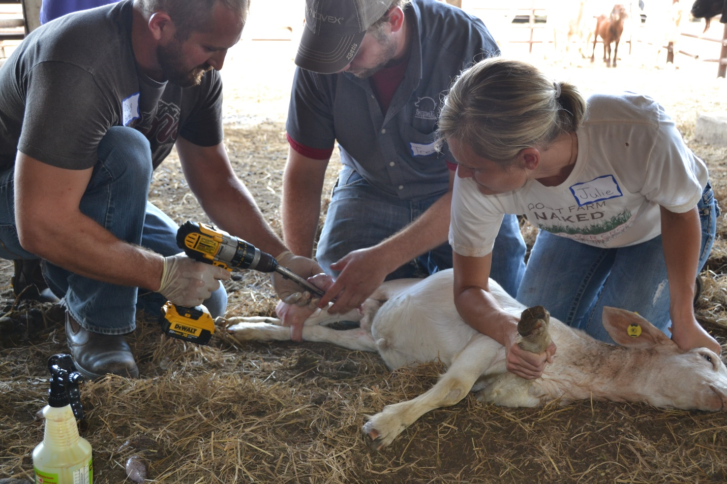 With Trevor and Julie’s assistance, a field day attendee uses the Henderson Castrating Tool on a goat. The first step in dealing with any herd health challenge is diagnosing the problem. The next step is contacting your veterinarian to communicate the health issues you are seeing. Kurt demonstrated to field day attendees the steps to conduct a necropsy and which bodily signs to observe. “When examining the stomach, look for ulcers; they can cause fatal blood clots. Also, it is important to see if the pig had been eating. If the pig’s stomach is empty, the pig went off feed, meaning it was likely feeling ill,” continued Kurt. Also, evaluate intestines to see if blood is present and the consistency of feces. Refreshing on animal health care skills help to make the best use of you and your veterinarian’s time when dealing with sick livestock. Thank you to Dr. Kurt Van Hulzen, Dr. Trevor Schwartz, and Julie for presenting such a practical, hands-on field day!